If you’ve heard about the little news about the coincidental clash for the release date of Batman V Superman and Captain America: Civil War Movie, and how BvS shifted their release date forward, I can say, this is perhaps the smartest move. BvS would have look amateur and silly as compared to Captain America: Civil War. Yes, I’m referring to the reason for their fight and the reason for stopping the fight (cough Martha). OK, I have to say, the two films has very similar base concept for their fights, the Russo directors seem to have taken everything wrong with BvS and made them right. If they hadn’t been screened just 1 month apart, we would have thought they have spied on the latter and right all the ridiculous mistakes and problems with Dawn of Justice. Darker than the previous instalments, including the Avengers, the script was almost flawless (amazingly), leaving no loose ends. Despite having taken my side on my Twitter several times (Yes, #TeamCap here), the film had successfully made it impossible for me to pick a side. The reasons for the Avengers to take each side were sound, valid and reasonable. Yes, there were both political and personal reasons, but it was all a matter of perspective. There were several action sequences in the film, and each fight has a different purpose – be it introductory, blockbuster, personal or polictical. There wasn’t a single one which made you wonder “why are you fighting again?”. With the interpersonal relationships established, the actors had built up their chemistry over the years, each character had their own agenda and every hero cared about one another (except perhaps T’Challa’s Black Panther – initially). If you thought the epic showdown at the airport was crazy, wait till you see the final fight which was built upon Steve Rogers, Bucky and Tony Stark. What’s personal made the fight more emotionally painful that political reasons. p style=”text-align: justify;”> Heavy feelings aside, the humour within the family is still very much present sans Thor’s hammer and Hulk’s rage. While I don’t really want to watch Uncle Ben die the third time, I’m impressed how the directors made the introduction of each new character as memorable as possible (yeap, I’m not spoiling them for you. Go catch it yourself – homework is still important regardless what Tony Stark says). If you think The Avengers was good, wait till you watch the Civil War. It’s human, it’s moral and it’s personal. When faced with the reality of the consequences of their actions, the internal struggle made it such that there is no right or wrong standing on either side, to sign or not to sign the Accord. This is the live-action debut of T’Challa, the Black Panther, one of the first African superheroes. Chadwick Boseman underwent a vigorous training program to get in fighting shape for the character. While admittedly not a big reader of comics as a kid, Boseman read as many comics as possible for anything Black Panther-related. He also visited South Africa to better incorporate cultural aspects of the country into his role. In the film, the Falcon (Sam Wilson) utilizes a falcon drone called Redwing. In the mainstream Marvel comics, Redwing was an actual falcon, which was Sam Wilson’s sidekick. Tom Holland is the youngest person to portray Spider-Man/Peter Parker on screen at 19 years old. This marks Spider-Man/Peter Parker’s debut in the Marvel Cinematic Universe. In this film, Tom Holland’s portrayal Spiderman/Peter Parker will be just 15 years old and already have discovered his spider like powers, with Tom Holland being just 19 in real life. One scene shows Ant-Man being boosted by an arrow from Hawkeye. This is taken directly from the comics, specifically The Avengers #223. This will be the first Marvel Cinematic Universe movie where Robert Downey Jr. was credited but not top billed. In Civil War storyline, Captain America was killed by Crossbones (Brock Rumlow). In this film Crossbones is the one who dies. In the original Civil War storyline, Steve Rogers (Captain America) is killed and Bucky Barnes (The Winter Soldier) and Sam Wilson (Falcon) become the new Captain America(s). In the comics the Fantastic 4 play a big role in the story. Due to Marvel not owning rights to them and the Fantastic 4 getting a reboot in 2015 this will not happen. The trailer broke the record previously held by Star Wars: Episode VII – The Force Awakens (2015) for the most views in 24 hours with 64 million views. 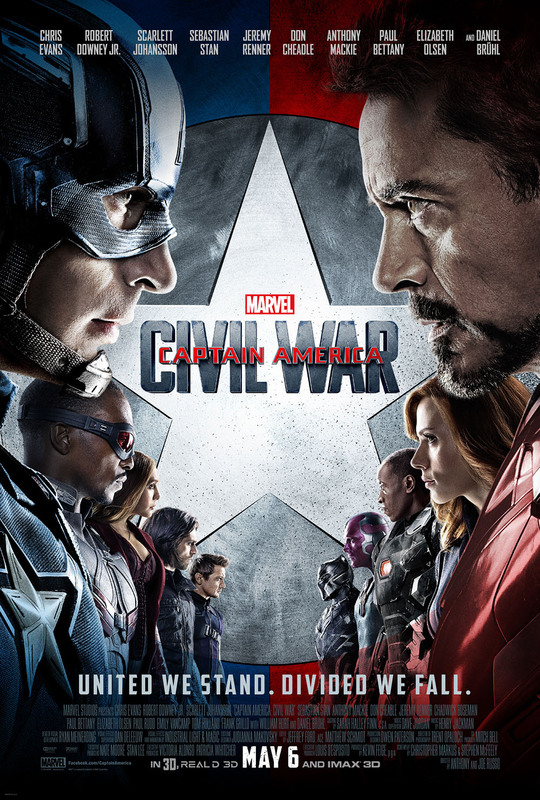 Check out Marvel’s Captain America: Civil War Movie Official Website and Facebook Page! Marvel’s Captain America: Civil War Movie is out in cinemas on 28 April 2016. I like this more than batman v superman. It has more content and the storyline are way much better. I am team Ironman. Batman is famous, so is superman. The actors are pretty famous too. But does that means the film was good? Nope! So what you said might contribute to success but definitely not the only factor. Oh I’m so excited to watch this! I’m trying to avoid the crowds when it came out but I think I just might go today! Having only recently binged watched all the other films; Your review only makes me more excited to watch this latest installment. Excellent review, love all the little random facts. Looks like a great movie. I am glad that Spiderman is now in the group as he is my favorite Marvel hero. I hope I don’t get slammed by haters for this comment but I am more of a DC fan. I watched it and I liked it. Robert Downey Junior is my favourite! This movie is much better than Batman vs Superman. Every review about Civil War is just glowing! Makes me excited to watch it this weekend, hope it lives up to all of the expectations! After reading your review, I’m gonna definitely watch the movie..have been too busy lately! I guess it’s high time I set my eyes on this movie to ease off the anxiousness boiling within me. This review is massive and loving the Movie more. I did not know till now that the director considered that scene where Cap was holding a copter down with his brute strength was the “most powerful shot in the film”. I really noted that while I was watching the film. That scene really emanated power and strength of Cap America. I enjoyed the movie as well. It’s easy to understand and you can definitely relate to it especially if you’ve watched all the movies from the franchise. I love the story line. Although, from a comic book fan’s perspective, it was a little lacking, if you didn’t read the comics, you will love the movie regardless. Honestly, I can’t decide between being in #TeamCap and #TeamIronMan, because I like both men! I am so looking forward to the day that I can watch this in the cinemas… I wonder when that would be, haha! I haven’t watched the movie but I hope to finally catch it this weekend. Funny how they let Cap take the side against the government and Ironman taking their side. It seems like Cap is a boy scout that’s all about establishing the rule of law and ironman/Tony Starks just not giving a damn. Totally agree! Ironic yet amazing! I haven’t watch this movie yet but I do follow Robert Downey Jr. on Facebook. Apparently the entire bunch of actors in this movie are actively leveraging on this movie for a collaborated charity effort. That, I like alot!! I am actually looking forward to seeing the movie and can’t wait. I’m a big Chris fan and have always preferred Captain America over Iron Man. He’s just a bit too cocky for me. Can’t wait to see how it all plays out. Same here! I prefer Captain America as he’s more down to earth! Tony Stark is too arrogant! 64 million views in 24 hours, that’s crazy?!?! This looks like an exciting movie and is definitely something I’d watch. Daniel Bruhl as Zemo is mysterious and you don’t really understand why he does certain thing right from the start. Unlike Lex Luthor in BvS whose reason was psychotically ridiculous, Zemo has a valid reason and motivation for creating the conflict and hating the heroes. Not that I will say he’s right, but definitely understandable.